The recent lyrical war between SarkCess Music signee Strongmanand Spyderlee Entertainment act Teephlow has taken a new twist and it’s becoming scary than what we ever imagined. As a reminder, somewhere last week, rapper Teephlow released a diss song titled ‘Preach‘ just to dim the arrogance of Strongman who had earlier on burnt him lyrically with ‘charcoal‘. Strongman after listening to ‘Preach’ couldn’t stand and in the process begged his label boss, Sarkodie to allow him dirty himself with a rebuttal song to silence his arc rival. But in the process of calming the nerves of rapper Strongman to let sleeping dogs lie has mistakenly resurrected Strongman’s long standing ‘war’ with Hammer of The Last Two. Hammer of The Last Two happens to be a renowned record producer and more importantly known for talent nurturing. Thus, he goes for raw talents and transforms them into real musical idols. From Obrafour to Tinny to Kwaw Kese to Ayigbe Edem. The list is endless, not forgetting the number of artistes who have passed through his hands. 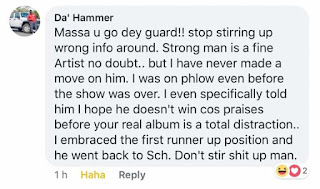 To clarify things, Teephlow who happens to be Strongman’s arch-rival was nurtured by Hammer of The Last after both had successfully passed through Next Big Thing In Gh Hip-Hop competition in 2012. 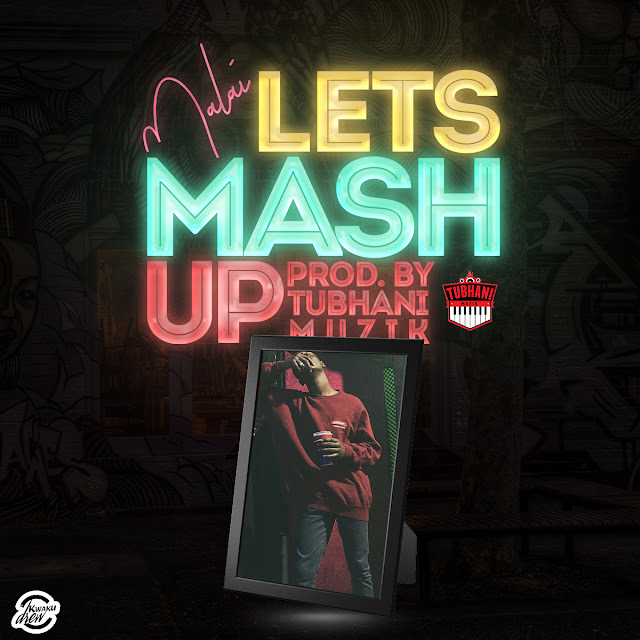 Strongman who came as winner of the competition was signed onto MicBurners while Teephlow was taken by Hammer of The Last Two. 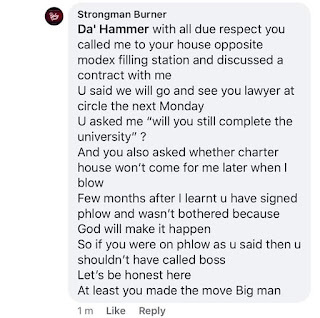 Now, a leak chat intercepted by Dawuroo.com has it that Osei Kwaku Vincent, also known as Strongman has called Hammer of The Last Two a lair for saying that he never attempted to sign him during and after the Next Big Thing In Gh Hip-Hop competition. 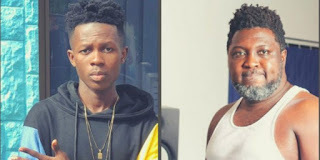 Contrary to Strongman’s assertion, Hammer has opined that he never thought of signing Strongman despite the fact that he’s lyrically overdose. According to Hammer, he had earlier on talked to Teephlow on his willingness to sign him after the Next Big Thing In Gh Hip-Hop competition. Therefore, in the voice of Hammer, Strongman should stop spreading false information. See screenshot below. Well, as at now we can’t accept one and nullify the assertion of the other. Regardless we’ll keep you posted on later development.